A classic cocktail bar located in Birmingham's historic downtown Loft District. Port of Spain, Trinidad. 1895. What’s in a name? We named our bar after the Queen’s Park Swizzle, a cocktail created at the Queen’s Park Hotel, located in Port of Spain, Trinidad. The hotel enjoyed moderate success until 1920, when the purchase and consumption of alcohol in the United States was made more or less illegal by the 18th Amendment. Overnight, Americans who had the means to travel began to leave the country on weekend trips to the Caribbean, where they could drink legally. Hotel management hired now-unemployable bartenders from major US cities, who brought with them scores of regulars as well as decades of cocktail expertise. 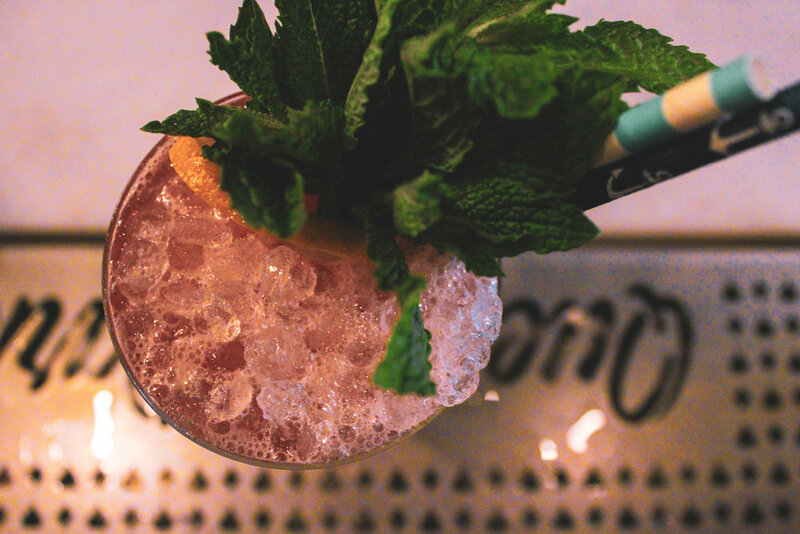 Tasked with coming up with a signature drink for the hotel, these bartenders took the wildly popular Daiquiri - made with rum, sugar, and lime - and put it on crushed ice, dressing up the drink with the addition of mint and a float of locally made Angostura bitters. A star was born - the drink was a sensation that endured throughout the years, with Trader Vic proclaiming it “the most delightful form of anesthesia given out today” in 1946. While the original Queen’s Park Hotel closed in 1996, our bar carries on the spirit of its namesake with incredible hospitality, lesser-known classic cocktails made with exacting precision and consistency, and décor that harkens to that grand hotel in Trinidad. Larry “Mudd” Townley is a Birmingham native who has worked in the Birmingham bar scene for 14 years. He most recently served as the general manager for Dave’s Pub, where he worked for 10 years, during which he also served on the board of the Five Points Merchants Association. For the past several years he has created the signature “Taste of Five Points” cocktail, which is featured throughout the neighborhood. He has appeared on AL.com, WBRC, and WIAT. In his spare time, Larry works with youth rugby and the Birmingham Humane Society. Laura Newman is a Brooklyn native who moved to Birmingham, Alabama in the spring of 2017. While she initially intended for the move to be temporary, she was so taken by the thriving local food and beverage scene that she immediately decided to open a bar in the booming downtown Loft District. While in New York City, Laura was the St-Germain Brooklyn brand ambassador. She also worked at bars and restaurants such as Dover, Bergen Hill, Bacchanal, and Sweet Polly, and served as the assistant beverage director for Mother of Pearl and Cienfuegos. Laura is a Certified Sommelier by the Court of Master Sommeliers, has a degree in hospitality management from the Institute of Culinary Education, served in the Cocktail Apprentice Program at Tales of the Cocktail 2016, and has presented at numerous industry events and seminars. She and her work have been featured in publications such as Time Out New York, Beverage Media, Tasting Table, Coastal Living, and Liquor.com. She has also been featured in books such as Maggie Hoffman’s The One Bottle Cocktail and Clair McLafferty’s Romantic Cocktails. Laura has been a national and regional finalist in competitions such as Patron’s Margarita of the Year, the Woodford Manhattan Experience, and Speed Rack. Most recently, she won the USBG World Class US 2018 competition, sponsored by Diageo, and placed in the top 4 cutoff at the global finals in Berlin. Queen’s Park does not have a business phone number. Email or the form to the right is the best way to contact us. We respond to messages as quickly as possible. Thank you! We’ll respond to your message as soon as we can.